The Cosmic Lens All-Sky Survey (CLASS) is an international project aimed at discovering a large number of gravitational lens systems to provide a well-selected controlled sample for cosmological studies. To date, CLASS has yielded 11 new lenses, one of which is B1933+503. This object is peculiar, in that 10 distinct images are seen! In fact, B1933+503 is three separate components of a background triple source that are imaged into 2 quads and a double. 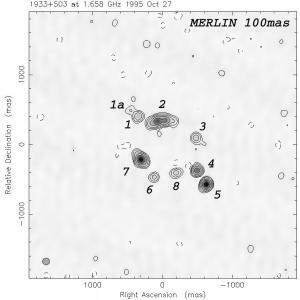 MERLIN image at resolution of 0.1" showing 8 of the 10 lensed images. Images 1, 3, 4 and 6 correspond to the core of a compact symmetric object (CSO). 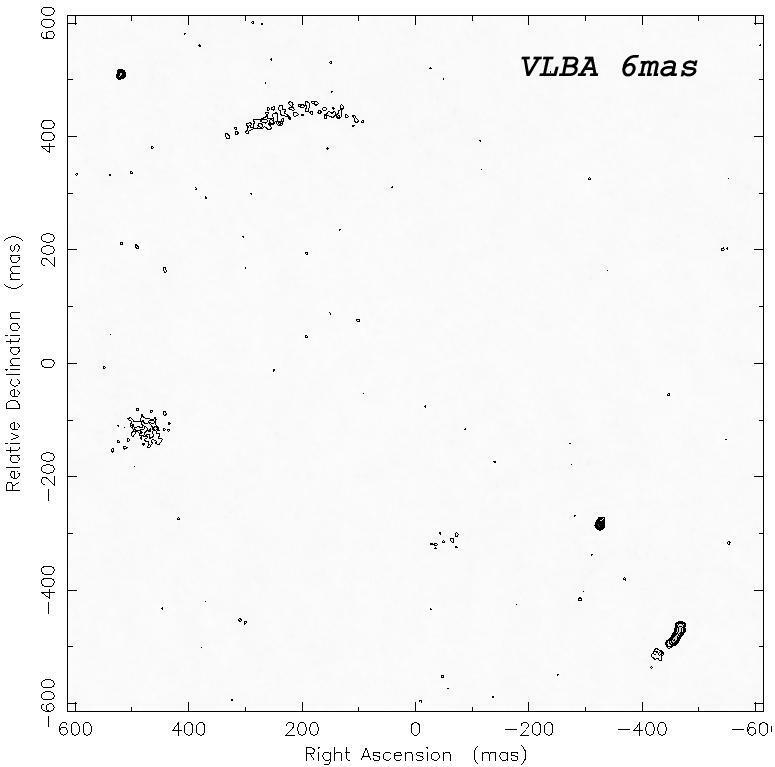 VLBA image showing the compact components 1, 2, 4, 5 & 7 using the full resolution of 0.006". More extended structure is resolved out by the array. Note that the double images 2 and 5 are lensed into arcs. 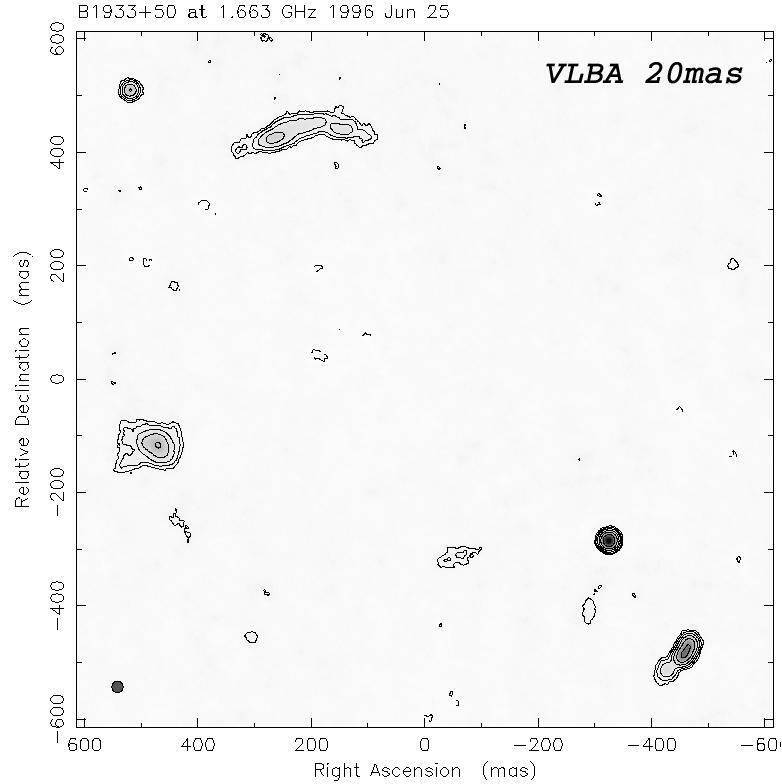 VLBA image smoothed to a resolution of 0.02", which brings out the extended structures. Component 8 is now visible, however components 3 & 6 which should form a quadruple image with 1, 4, are still missing (possible variability? interstellar scattering?). 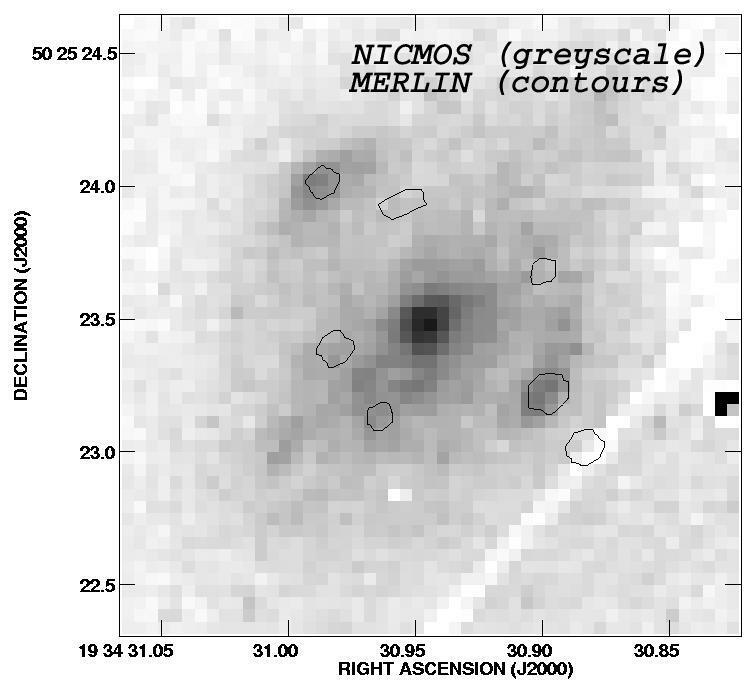 NICMOS image from the Hubble Space Telescope with the low contours from the MERLIN image overlaid to show where images should be located. The elliptical lensing galaxy can be seen in the center. Images 1 and 4 are clearly seen, while 3 and 6 are missing, making variability an unlikely explanation. However, these are along the major axis of the lensing galaxy, so interstellar scattering (broadening) may be the cause of the missing images! The identity of the images has been confirmed by comparing the spectral energy distributions of the components through multi-frequency observations. 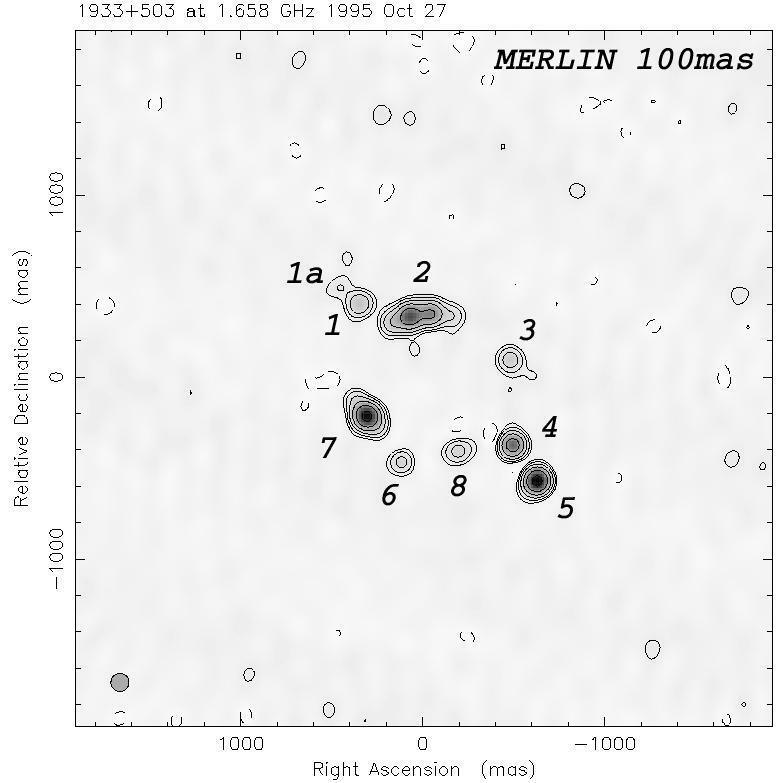 Observations at a range of resolutions at the same frequency (as shown in the above figures) provides extra information on the images, such as whether they are smeared into arcs, or possible interstellar scattering due to the ISM of the lensing galaxy. 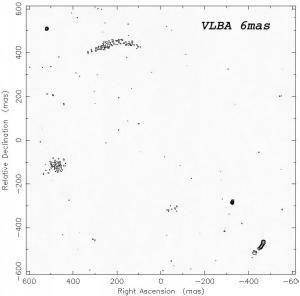 In particular, the VLBI positions of the components are important input to the lensing model. Finally, optical observations are required to pin down the position and shape of the lensing galaxy, as well as the redshifts of the source and lens. 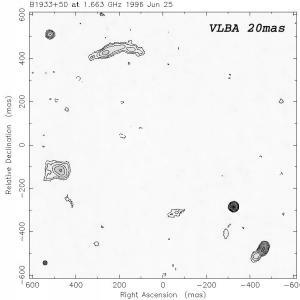 "The Complex Gravitational Lens System B1933+503"
"NICMOS and VLBA observations of the gravitational lens system B1933+503"